Excellently situated only 100 metres from the superb sandy beach this neat family owned accommodation is an ideal base for a self catering holiday. It was used in a film sequence by a well known British film and TV actor, who still keeps in touch with the owner. It offers an excellent opportunity to be independant and book direct with local owners. AccommodationApartment  Two twin bedrooms, shower-room, kitchenette and breakfast bar and balcony. 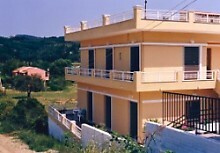 Studios  Twin-bedded room, shower-room, kitchenette, dining area and balcony. Rooms  Twin-bedded rooms with cooking facilities, plus shower-room. The accommodation has the usual cooking facilities, showers, WCs etc. Internet access is available for guests. Situation The apartments and studios are in a perfect situation for beach lovers in particular and for those people wishing to be close to some tavernas and restaurants. Quietly set back a few metres from the narrow road only 2 minutes walk from the beach this handful of privately owned units will suit visitors looking for a good base with some privacy and not wishing to be in a large complex of busy noisy apartments. 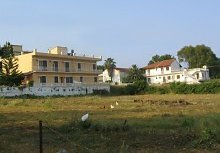 At the side and rear is undeveloped agricultural land and so the accommodation is not overlooked. Nearby there are several small supermarket shops for everyday needs while for eating out there is a choice of tavernas, restaurants or hotels. Eating out in this part of Corfu is very good value compared to many western European countries. Of course the major attraction for many people is the magnificent sandy beach only about 100 metres away for swimming, sun bathing and numerous water sports. This will be a favourite for the children. 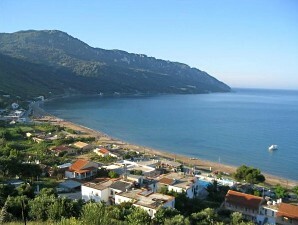 ResortThe beautiful, quiet resort of Agios Georgios North is approximately 30 km from Corfu town and the airport. It is famous for its wide sweeping bay and huge sandy beach . Tucked away down narrow approach roads it does not suffer from the problems of heavy through traffic like many other resorts. The resort is surrounded by green hills covered with cool olive groves and agricultural fields. It is ideal for walkers and beach lovers or those just wanting a relaxing holiday break. There are plenty of Tavernas and Restaurants to choose from but the resort is not likely to appeal to teenagers wanting to "live it up". Nearby is a friendly mini-mart, a shop for money exchange and an internet cafe. TaxisTransfers from the Airport are no problem. Taxis should preferably be pre-booked as there are reports of gross overcharging when picked up casually at the airport. 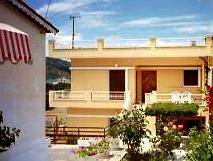 The Apartment owner, George Makri, will be pleased to do this for you as long as you give at least 4 days notice of your Flight Number and time of arrival at Corfu airport. This also has the advantage that the taxi driver will know exactly where the apartments are. Price guide: 2018 about 55 euros (depending on time of arrival). Car HireCar Hire is available locally from reliable companies using modern air conditioned models at considerably cheaper rates than the International companies. So book locally after arrival. This page is a private advertisement for the accommodation owner. It is NOT placed by an agent. The web page and details are published for guidance only. Any persons must arrange their own travel and accommodation and will have contracts direct with the airline and accommodation owner.